I've never been a religious man, but I heard those nuns can be pretty violent at times. 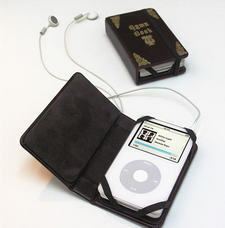 Nuns seeing an iPod is like showing red to a bull, so there is only one true way to protect from a ruler beating—with a hymn book iPod case. Just hope the the nuns don't make you prove that your miniature hymn book really does contain hymns. I don't think Justin Timberlake is an acceptable hymn.